Thin and crispy, chewy and sticky. 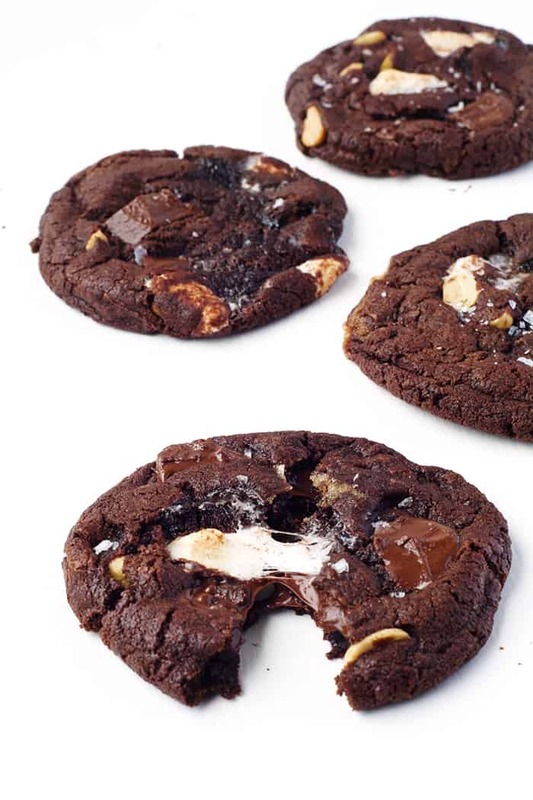 These chocolate cookies are next level. 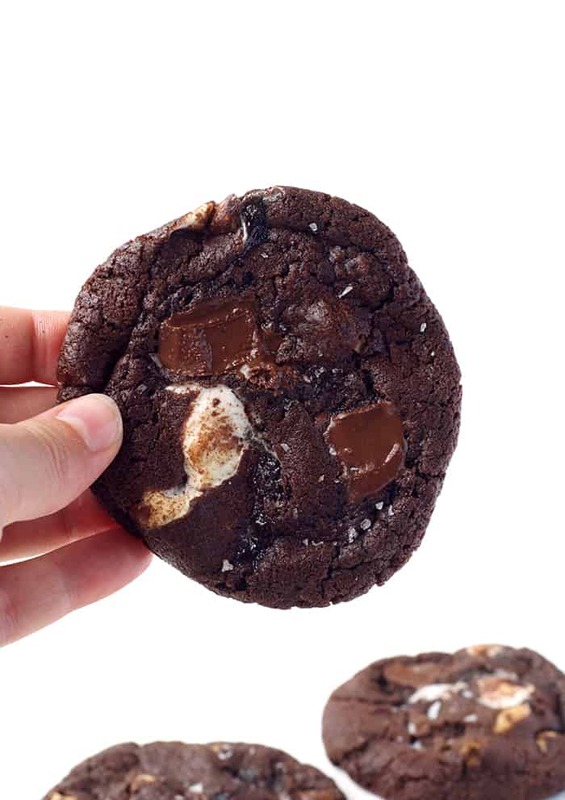 Stuffed with mini marshmallows, roasted peanuts and chunky pieces of chocolate, they are the ultimate chocolate treat. The finishing touch is a sprinkling of sea salt. 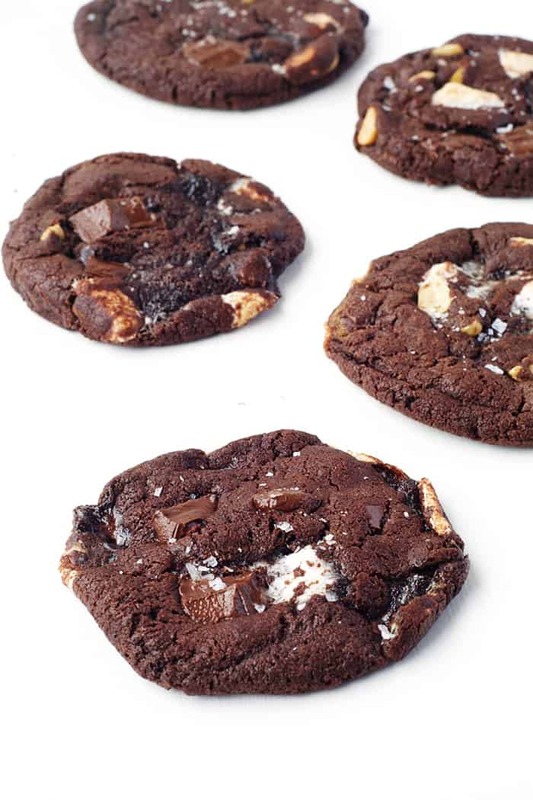 With sticky puddles of melted marshmallows, gooey dark chocolate, and salted peanuts in EVERY bite, these cookies are a rocky road lovers delight. I have always been a big, thick cookie enthusiast but lately, I’ve been craving thin and crispy cookies more and more. 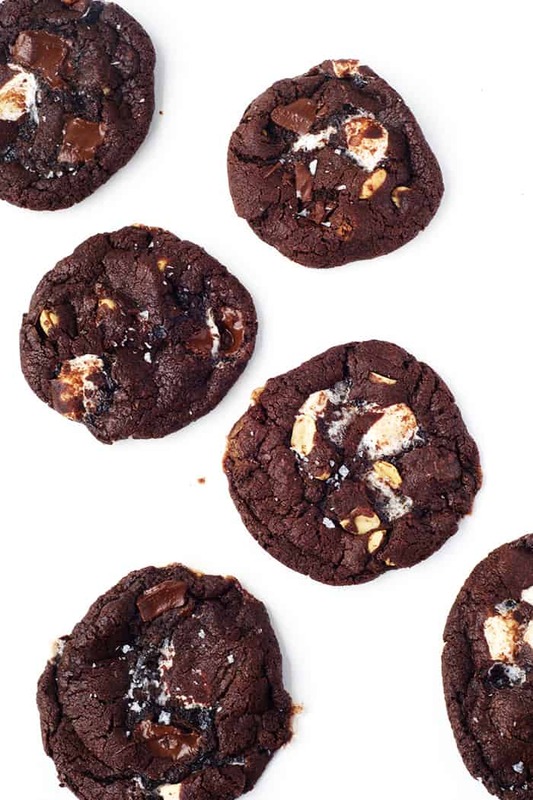 I could eat my Chewy Cornflake Marshmallow Cookies ALL DAY LONG. So how do you make a good thin and crispy cookie? First, you need the perfect ratio of butter, sugar and flour. This cookie dough doesn’t require any chilling, otherwise they will be much thicker. Baking the dough straight away will ensure they are lovely and flat. 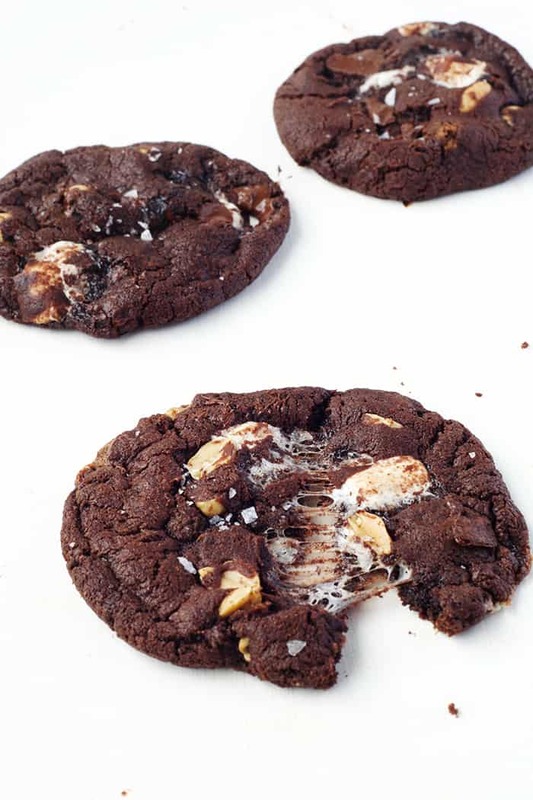 Then there’s the roasted peanuts = my new FAVE thing to add to a cookie. 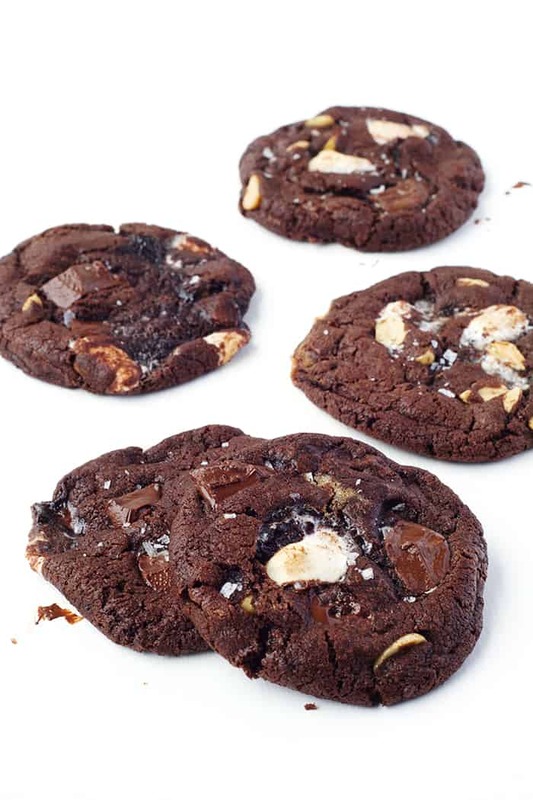 They add the perfect crunch AND a touch of salt, which makes these cookies AMAZING. 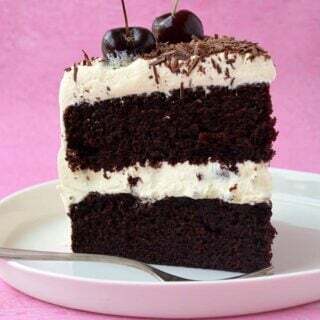 It’s like a little slice of rocky road heaven. 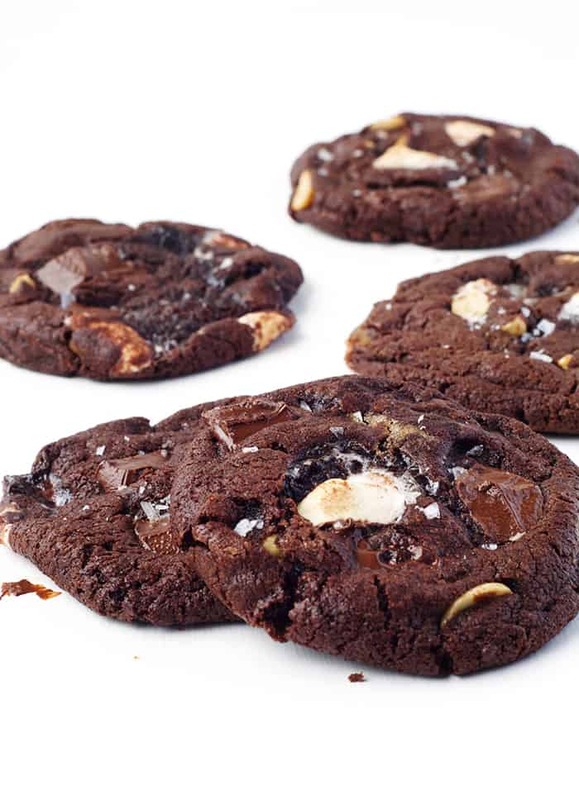 So if you love chewy chocolate cookies, you need to try these. And even if you normally like thick, cakey cookies, you NEED to try these anyway because they are the BEST. Once these cookies are baked to perfection, you will need to let them cool completely as they are extra fragile. So be patient and you will be rewarded with an extra special chewy chocolately treat. 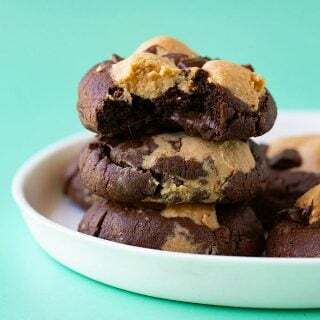 My only other advice, is to invite some friends over when you make these because they are irresistible! Honestly, you will not be able to stop at one – well I know I sure couldn’t! 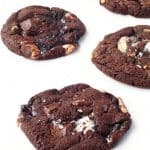 With melted marshmallows, gooey dark chocolate, and salted peanuts in EVERY bite, these Dark Chocolate Marshmallow Cookies are a rocky road lovers delight. Preheat the oven to 160 C (320 F). Line two cookie or oven trays with baking or parchment paper. In a large mixing bowl, add your butter and sugars and beat until pale and creamy (approximately 2-3 minutes). Add your vanilla extract and your egg and mix until combined. 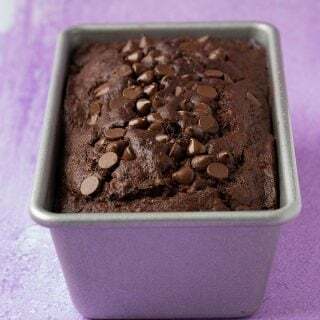 Next, add your cocoa powder, flour and baking soda. Stir gently using a wooden spoon or plastic spatula. 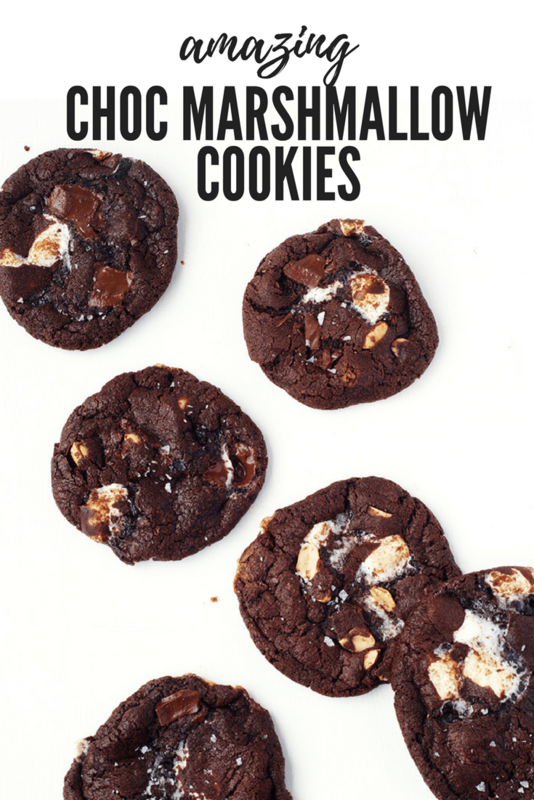 Add your marshmallows, peanuts and dark chocolate to your dough and stir. Roll the cookie dough into balls and place on your prepared trays, ensuring there is enough room for the cookie to spread out. Bake for approximately 12 minutes. Sprinkle with sea salt. Leave to cool for at least 5 minutes on the tray before carefully transferring to a wire rack to cool completely. I am loooooving these cookies!